When we checked in to the Hotel Zagreb, the desk clerk was quite helpful and gave us a number of suggestions for touring the Old City in the morning. After dropping off our bags and getting cleaned up, we headed out to the promenade that along front of the hotel and down to the Lapad Beach. All along the promenade are shops, cafes and restaurants. 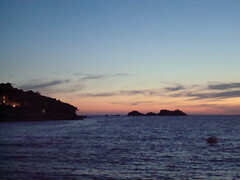 We took a couple snapshots of the sunset and walked back up to one of the restaurants for dinner. 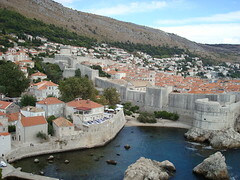 The desk clerk had suggested going up onto the walls of the Old City. 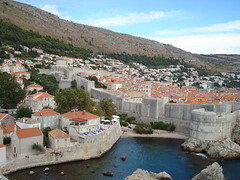 We had a nice continental breakfast and then took a city bus down to the Old City where we took a walking tour of the walls ("Dubrovnik Walls & Wars" from Dubrovnik Walks, www.dubrovnikwalks.com). 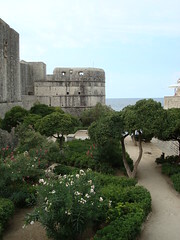 Our tour guide, Marco, was very pleasant and enthusiastic as he explained the history of Dubrovnik (formally known as the Republic of Ragusa) and the many conflicts that affected the city - from ancient Greek and Roman conflicts through the Civil War in 1999. We spent a couple hours on Wednesday trying to book a sea kayak trip. None of the outfitters was going out because of the wind. We visited with one outfitter (who used closed-deck sea kayaks) to try and book a trip for the next day but they launched their tours from a beach a ways south of the Old City and the logistics of trying to squeeze in a trip before leaving just weren't working out. We checked with a second outfitter whose trips left from just outside the Old City's Pile Gate and whose schedule worked much better with ours. We made a reservation for Thursday, weather permitting. The only catch was that this outfitter used sit-on-top kayaks. (Sit-on-tops work well for beginners and scuba divers, but we were neither). That late in the day, catching a bus from the Old City back to Lapad was a little difficult, so we opted for walking back to the motel - about a mile. 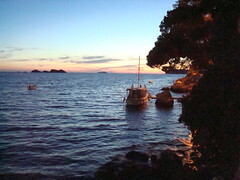 We went for a quick swim at the beach at Lapad Bay and then had a nice dinner along the waterfront. On Thursday morning we got up and had breakfast at the hotel. Also at the hotel were a large group of Americans who were just starting a bicycle tour of Croatia. This was the first time during our trip that we had been around so many Americans - prior to that our fellow travelers had been mostly from Europe or Australia. After checking out, we headed back to the Old City hoping that the weather would hold for the short sea kayak trip we had booked prior to leaving for Zagreb. 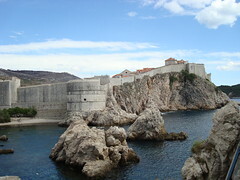 Our trip started at the small beach and pier just west of the walled city. 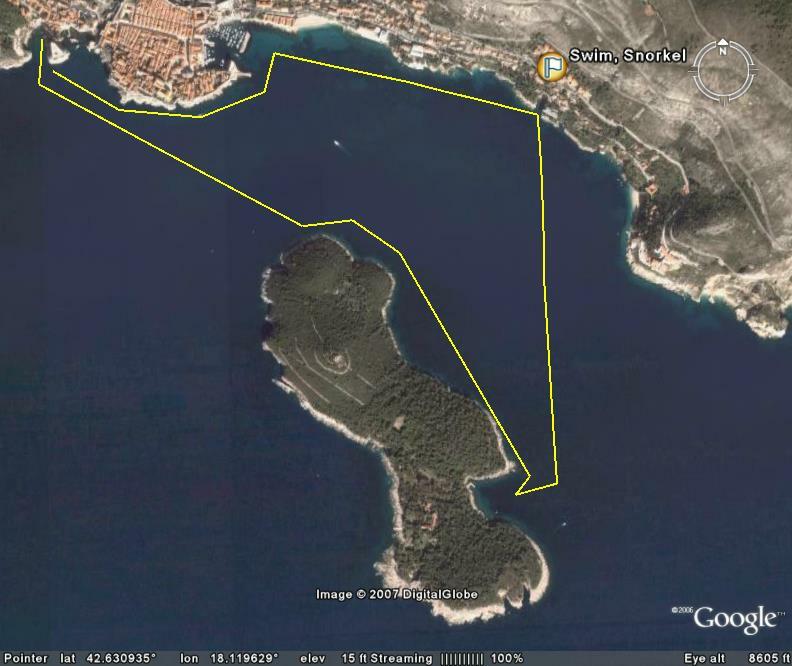 Our group of three tandem kayaks, one single kayak, and two guides (each in their own boats) paddled south to the island of Lokrum. 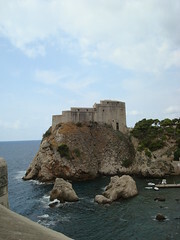 We made our way along the east shore of the island with our guides Jožko and Ivana. After paddling to the harbor, we turned and headed north stopping at a secluded beach and sea cave where we swam, snorkeled, and had an early lunch of Damatian ham and cheese sandwiches. Concerned about some rough weather on the horizon, we packed up and started paddling back along the coast. As we neared the old harbor, the wind and swells had picked up. Our trip back along the City Walls was straight into the wind and waves. Arriving back at the dock, we changed into some dry clothes and grabbed a city bus to the main bus station where we waited for a bus to the airport. Passenger screening at the Dubrovnik airport was very thorough, with police officers doing the screening. Anyone setting off the metal detector was given a quick, business-like pat-search by one of the officers. The flight back to Zagreb was uneventful. The weather was cool and raining, something we hadn't really dressed for after all the warm weather on the coast. We took the bus for to the main bus station, and decided to brave the drizzle and walk to our hotel several blocks away instead of taking the streetcar. As we walked, the drizzle turned to a steady rain. 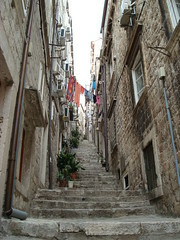 We checked in to our room, put on some dry clothes, and headed up to the old town for one last meal in Croatia. We got up at 4:00 a.m.*, checked out, and grabbed a taxi cab. The driver sped through the wet streets but we made it to the airport. We checked in, waited, then boarded our flight to Frankfurt. While in flight, they announced that we would be about 15 minutes late arriving in Frankfurt. When we landed in Frankfurt, we ran off hoping to catch our connecting flight to Heathrow - only to find that we had to go through security screening to get in to the terminal. Between the 15 minute delay and the extra screening we missed our connecting flight. The nice lady at the Lufthansa desk re-booked us on a direct flight to SFO** which saved us from having to suffer through Heathrow again and got us home an hour sooner. The bad news is that Frankfurt to SFO is an 11 hour flight. We arrived in San Francisco about 4:00 p.m., picked up our bags, went through customs and immigration, and then headed to the BART station located at the airport. We headed over to the East Bay and picked up our car and dog. After loading the dog into the car and getting on the freeway, we realized that she needed a bath, so we stopped at the closest self-service dog wash, cleaned up the dog, and headed home, arriving at about 6:30 p.m. - about 25 hours after we started our trip.